101 Things to do with Baby is a children's picture book by Jan Ormerod, recently re-published by Little Hare, an imprint of Hardie Grant Egmont (2012.) I have previously reviewed Ormerod's When an Elephant Comes to School. First published in 1984, 101 Things to do with Baby has a timeless appeal. Little ones can see a new baby as an interloper. 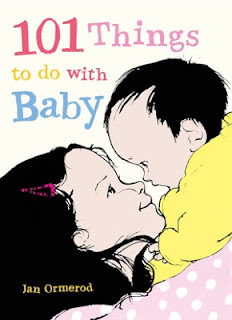 This book will help them focus on the positive and help them see Baby as someone to have fun with. Not all the "Things to do" are fun - kids will grin over some of Baby's less endearing ways such as shoe-sucking, letter-eating and ankle-biting! But there are also "Things to do" like playing peek-a-boo and borrowing Baby's basket to sleep in. Big sisters can be really helpful, especially when they start counting all the things they can do with Baby. I love the way Ormerod has detailed each "Thing" with its number, making this a counting book as well as an advice manual. Her limited palette illustrations are detailed enough that beginning readers have lots of contextual cues to read this book aloud - to Mum, or Grandpa, and yes, even to Baby. I love love love Jan Ormerod! @Even in Australia From what I read at your great Even in Australia blog, you love love love so many authors/illustrators! Hope you'll join in with International Book Giving Day on February 14! How have I not heard of this book! It sounds great and I love Jan Ormerod. Thanks for sharing at The Children's Bookshelf! There many early learners in my lit group who are either getting a new sibling or new sibling has just arrived. I'll be recommending this book to parents and will share it in my sessions. Hmmm...what song/music do you think can accompany this? @PamYou know, I would ask the kids what songs they think would be great to share with Baby! What song might help Baby sleep? What song might make Baby giggle? What song might teach Baby something? We haven't read this book, but it sounds like a wonderful book from your review! Thanks for linking up to The Children's Bookshelf! @Bethany Winston I love Ormerod's books!